This game was released in 1990. It is a port from the arcade. The game starts off with your plane crashing onto the jungle floor. From there, you have to fight your way through wave after wave of enemies. You get 99 grenades and 99 bullets. You can replenish your ammo simply by collecting the gun or grenade “pow” items left behind by enemies. As you move along, you can pick up power ups. One upgrades your gun to a larger red shot with longer range. The other upgrade powers up your grenades. The grenades will have a much larger blast radius. Standing in your way are lots of enemies. There is the basic blue soldier that fires a gun at you (same shot as your non-upgraded gun). A second enemy is the blue grenade thrower who throws grenades at you. As you progress, you’ll encounter commandos who also fires regular shots at you. To make matters more interesting, there are also flashing blue soldiers who explode if you kill them. You’ll encounter a number of structures along the way. There is a basic building that explodes if you hit it with a grenade. A second structure is a machine gun emplacement. A gun will fire at you, but can also be taken out with a grenade. Additionally, there is multi-directional arrow shooting nests. Again, a grenade can wipe these structures out. In addition to this, there are mines. The mines do appear as you approach them, but it is more than possible to not react in time, setting it off and killing you in the process. There is also floating mines that float toward you in the water. To top it off, there is bomb drop points. A shadow will appear, but it is very difficult to avoid if you don’t know where they are located. As you progress, you’ll notice the environment can also be an obstacle. While destructible walls are one big impediment, other things such as walls, rocks, and water also make things more complicated. You can walk through the water, but beware of the fact that enemies can hide in the water as well. Vehicles are also present in this game. There are tanks that fire grenade like shells at you. There are also helicopters that fire a lot of shots everywhere. Once again, grenades are your friends here. While you start off with three lives, it is possible to earn more lives along the way. This is achieved by earning 20,000 points. For every 20,000 points, you gain an extra life. This really helps you move further up in this game. One thing to note is the fact that this game is one giant level. Although there is an end to this game, you won’t encounter multiple levels as you progress. The goal is simply to run north as far as you can. One the one hand, it’s nice to see something that isn’t just randomly generated. It is also nice to see a game that actually has a goal. On the other hand, it does make for some relatively repetitive play. Although the terrain is always changing as you go along, there is still that sense of repetition. With so many games that, by this point in time, have segmented play, the one large level is a bit of an awkward style. While I can respect the idea of being different, but I’m not sure it’s exactly something that will stand out in the field. Keep in mind the fact that Mega Man 3 was released in the same year for some context. I would say that if this port was released a few years earlier, I would be happy to call it a stronger game. One can’t ignore the fact that this game does represent significant strides on the console itself. Unfortunately, it came too late. Generally speaking, this is far from being one of the worst on the system. While it wasn’t a bad play, it wasn’t exactly amazing for the time. 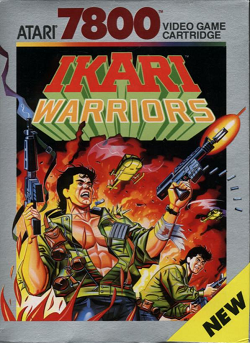 With stiff competition coming from the NES, this game had to really stand out – especially on the year it was released. Unfortunately, it doesn’t get there. While the variety in the single level setting was pretty decent for the system, it gets lost in the midst of all the competition floating around for the year. So, not bad, but there is much better out there by this time. Graphically speaking, this game is a much stronger effort on the system then a lot of other games I’ve been playing lately. It’s really nice to see a game that seemingly pushes the limits of the system to provide a half decent amount of eye candy. Unfortunately, with games like Captain Skyhawk and Super Mario Bros. 3, this level of quality came way too late for the system. It’s the kind of quality that should have been realized towards the beginning of the life cycle for this system, not the end. It is good, but not impressive. The music is one way that this game fueled that gameplay repetition. The level music never changes and is simply a single track throughout the entire thing. By the time I was half way through, I found myself asking if this would ever end. Not a thought a game should inspire. If the music changed from time to time, that would have made a world of difference. Unfortunately, all you get is the intro music and the single in-game track to keep you occupied. The sound effects are pretty decent though. Overall, this game is certainly better than a lot of other Atari 7800 games out there. If you look strictly at the Atari 7800 console, this is one of the better examples of gaming out there. Unfortunately, with the NES pushing out hit after hit after hit on their system, this game ends up getting lost in the shuffle. While the single level style gameplay is an interesting effort to break the mold, it ends up making the game feel like it takes forever to get through. The graphics aren’t bad for the system, but fails to compete against stronger NES titles floating around at the time. The single music track during gameplay made the game feel much more repetitive in spite of the efforts to keep variety in the game. The sound effects weren’t bad. Overall, a strong example of an Atari 7800, but not something that can compete against other games on other consoles. A decent play.